We all have different reasons for it. For me it is a way of staying sane, it is what I do when being an adult gets a little too real. When I run, my body sweats and my mind takes a shower. Everyone has their reasons but I never really wondered so much about why anybody ran. They are usually more than happy to tell you! Barry was different. It took me a while to figure out that he was a runner because he never spoke about it. I would share my latest running news but unless you asked him a direct question about whether he ran, he wasn’t sharing. It would take a few more conversations to find out that he didn’t just run, he was a serious runner. He had a marathon under his belt and a good few halves. It’s not that he didn’t look athletic, he just didn’t offer it as a line on his public CV. I found out Barry had ran the Cork marathon one day because it was on, I was grumbling about traffic and he casually said ‘Yeah I ran that last year. I didn’t prepare I just went and did it.’ It just left me curious. You just decided to run a marathon? You just woke up and thought “I have nothing else on today”??!!! WHAT? WHY? But no explanation. He just did. Looking back, if I am honest, I think my curiosity was more of a selfish probing for the answer I already had. I knew exactly why Barry ran. I met Barry at a barbeque in 2013 when he emerged from a bouncy castle and gave me his best Obama impression. I thought he was genuinely crazy. But over time although he confirmed my first impressions to be correct, I couldn’t get enough of my new friend who was nuts, yes, but more importantly he was fun, funny, positive and completely free of judgment. This guy had some rose tinted spectacles on and a nasty word never left his mouth. I asked within the group about Barry and like all friend groups you find things out about people that although are public knowledge are also things they themselves wouldn’t share too readily. And when he told me about running a marathon, I felt he did it as a means of letting his mind take a shower during some very tough times. My friend had lost people very close to him. But, you wouldn’t hear this from Barry. He confirmed with me recently that the reason he started to run was because in 2012, when dealing with family members who had become very sick it helped him to find a way to cope. And to this day, like many other runners, it helps him to manage the daily stresses that come with life. 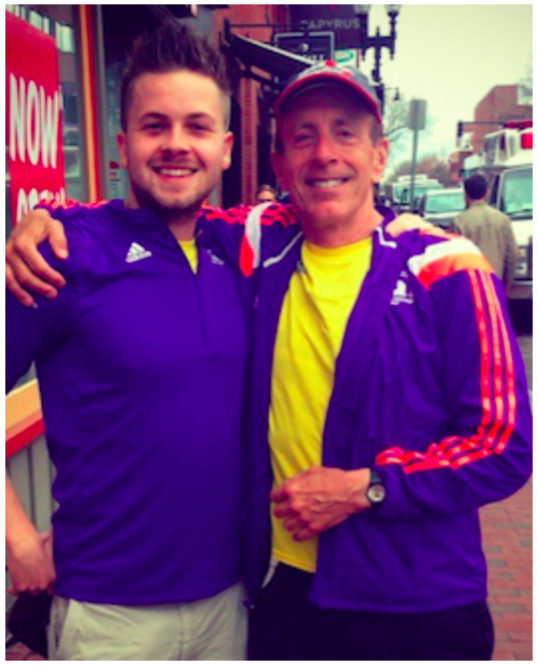 ‘On the bus to the start line of the 119th Boston Marathon in Hopkinton I met Joe Findaro of Washington DC. Joe was running his 8th Boston in a row. He had the entire back of the bus fired up. Laughing, sharing advice and making connections. Joe said his great grandmother was from a street near UCC in Co. Cork. We deduced we must be cousins and agreed to run the race together. “If you wan to run fast, run alone. If you want to run far, run together.” – said Joe. So when I saw photos of Barry and Joe completing the Boston Marathon together again in 2017 I was compelled to share this story. And as I write this, I can’t explain exactly why or what point I am trying to make, if any. Any story that would restore your faith in humanity is worth spreading I suppose. Barry’s experience as I see it kind of shows me that no matter how dark your days get, there’s potentially something/someone outstanding just waiting to get you running down the good side of Heartbreak Hill. I always imagined when Barry started running in 2012 it was during a time when he must have felt very alone. A time when a marathon couldn’t have hurt nearly as much as the experiences he was going through privately. I can’t help but feel pretty fecking chuffed that my friend found a brother through his solitary pursuit. In the space of a day, at an event that was once marred with hate, Joe and Barry embodied the very opposite.